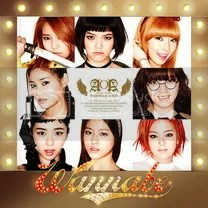 Wanna Be is the second single by South Korean band AOA, released on October 10, 2012. Kind of funny how all the girls picked a female character to depict in both the MV and cover art. Anyway, I was surprised by how catchy and good Get Out sounds, it’s a way better lead track than ‘ELVIS’ (and that one wasn’t too bad either). It has an edgy rock sound to it that I really like and Choa nailed it with the vocals again. The big surprise was Hyejeong’s little solo, she’s only a subvocalist and she sounded amazing! Good sound, amazing MV, I like this. Just like with their previous single, the second track is a more mellow ballad that comes after a booming opening track. Happy Ending is a more light and poppy track that also sounds cuter and more innocent than the lead track. The chorus is very catchy and I take the overly simplistic lyrics, not caring at all here. Jimin did a good rap as well, it fit the ambience of the song. What distinguishes these girls from all the other K-pop groups out there is their style. My Song is another uplifting and memorable song but this one has this band sound to the music, so that makes for some production value. The music sounds fuller than, for example, SNSD’s (no offense, I like them too). This is also what makes this song probably the best of the three. That and the fact that Choa has the most vocal parts.